This title was first published in 2000: A detailed study of a number of key issues arising in evaluation research, in particular the impact of context upon evaluation findings and the implication context has for methodology. Providing case study illustrations, the work includes discussion of definitions and uses, experimental logic, methods and difficulties in experimental evaluations and the importance of incorporating both process and context in evaluation research design. 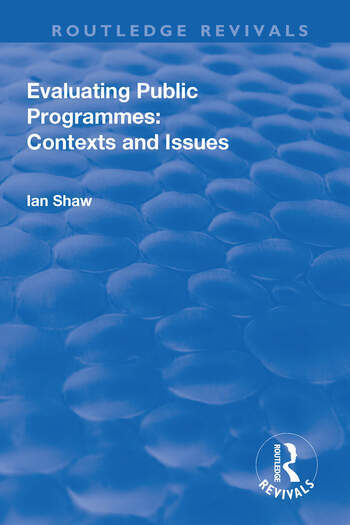 Contents: Introduction; The logic and development of evaluation; Issues in evaluating public services; Defining the goals of public services; Issues arising from the commissioning of research: case studies; The politics of evaluation; Bibliography.